If you can’t quite get round to the four-day process that is elderflower cordial or champagne, let alone deal with all those buckets and bottles, then this quick elderflower recipe might be for you. 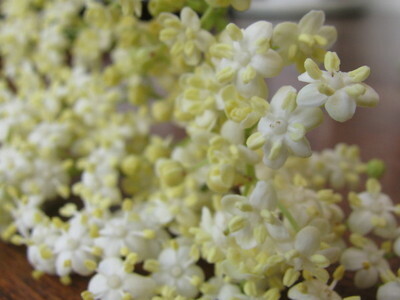 Elderflowers can be consumed whole, as they are, after a brief encounter with some batter and some hot oil. Put one or two heaped tablespoons of flour into a bowl. Pour in sparkling water (from a freshly opened bottle) while you whisk until you have a thin batter the consistency of cream. Flavour with a teaspoon or two of vanilla essence and pinch of salt. Immediately proceed to heating half an inch or so of sunflower oil in a wide pan. When it is hot enough to make a sprig of elderflower sizzle immediately it is ready. Start dipping your elderflower sprays in the batter, shaking off the excess and frying them for a few minutes until they are golden and the batter is cooked and crispy. Work in batches, snipping the stems off the flower heads once they are in the frying pan (you need them on before so you can dip the flowers in the batter). While the fritters are draining on kitchen paper for a few moments, sprinkle them with caster sugar and then serve immediately.